Robert Oster Signature inks come in tall plastic bottles. I like that they put a sticker on the top with a little swab of the ink. It makes picking out a color much easier in the drawers where I keep all my bottles. I would like if they put something similar on the front; right now there's just a (fancy!) gold sticker. As a note, I've seen that some reviewers' ink swatches are completely different from mine; please be sure to check out the reviews on Mountain of Ink (2017) and The Well-Appointed Desk (2018). I purchased mine as a sample from Pen Chalet towards the latter half of 2018. I'm not sure if I got a new formula, if my sample was taken from an older bottle, or what's up here. If you find this color interesting, I would suggest getting a sample before you spring for an entire bottle! 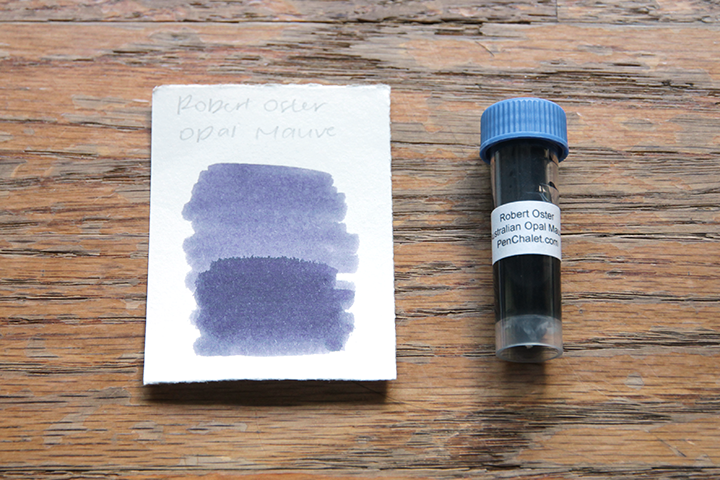 Robert Oster Signature Australian Opal Mauve is a gray-purple color. This ink does not stand up well to water. I would say that it has low to little water resistance. It doesn't take too long to dry on Kokuyo MIO paper: it was nearly done by 15 seconds, and completely dry by 30. There's no sheen at all, and there's not much shading either on Kokuyo MIO paper. 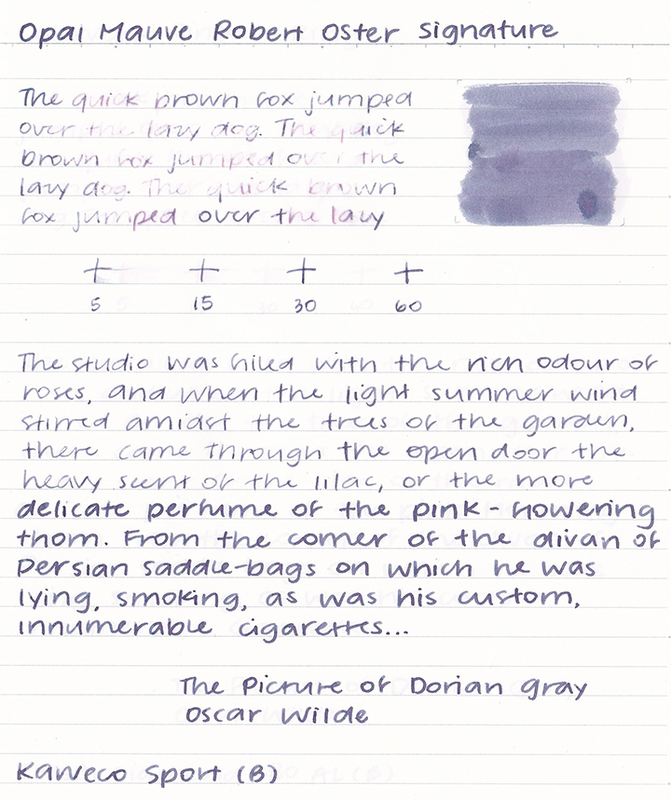 Australian Opal Mauve is definitely an interesting color on the page, especially on more resistant papers like Tomoe River It reminds me of Sailor Ink Studio 123, where the ink splits into gray, lilac, and green. I hope you can see the effect here! Surprising no one, there's not much that I'm able to compare this ink to. It looks different depending on the paper it's on—if it's just a smidge more absorbent, it reduces the "splitting" effect quite a bit. Sailor Shikiori Yozakura is much lighter and pinker. 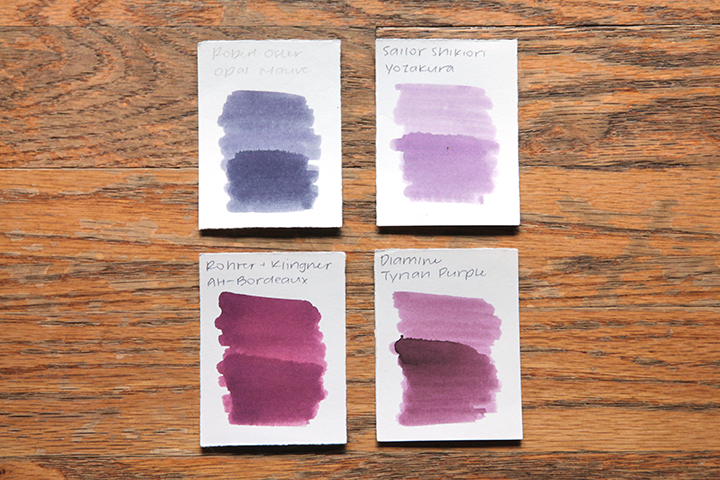 Rohrer & Klingner Alt-Bordeaux and Diamine Tyrian Purple are redder and deeper. I have this ink in my Kaweco Skyline Sport with a broad nib. The ink is quite wet and flows well. I've been enjoying using this combination on Tomoe River paper so I can see the ink's full properties. No complaints here! Australian Opal Mauve is definitely a color I wouldn't have picked up normally, but I'm really glad I grabbed a sample. 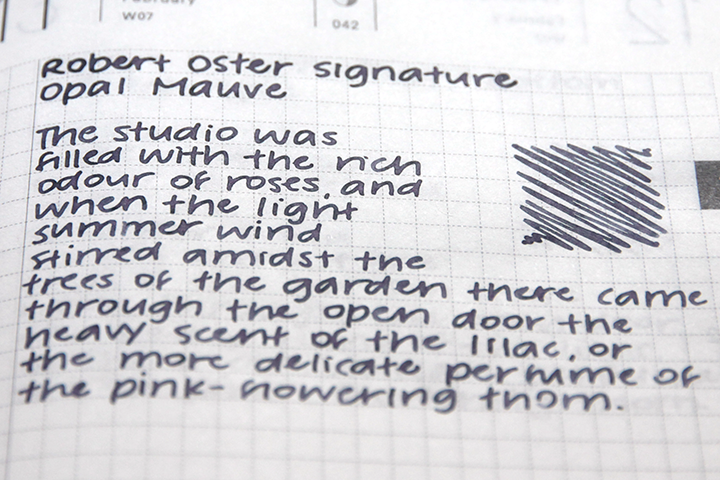 If you like the way that Sailor Ink Studio 123 looks but your eyes water a bit at the price tag, I think this ink would be a fitting replacement.